Definition at line 37 of file Xaction.h. Definition at line 76 of file Xaction.cc. References current_time, debugs, HTTPMSGLOCK(), icap_tio_finish, icap_tio_start, icap_tr_start, icapRequest, XactionInitiator::initAdaptation, and AsyncJob::typeName. Definition at line 108 of file Xaction.cc. References debugs, HTTPMSGUNLOCK(), icapRequest, and AsyncJob::typeName. Definition at line 408 of file Xaction.cc. References AsyncJob::callEnd(), closeConnection(), debugs, doneWithIo(), HERE(), status(), and AsyncJob::typeName. Definition at line 401 of file Xaction.cc. References AsyncJob::callException(), Adaptation::Icap::ServiceRep::noteFailure(), service(), setOutcome(), and Adaptation::Icap::xoError. Referenced by Adaptation::Icap::ModXact::callException(), and detailError(). Definition at line 513 of file Xaction.cc. References connection, Comm::Connection::fd, haveConnection(), Must, NULL, Comm::ReadCancel(), and reader. Referenced by Adaptation::Icap::ModXact::bypassFailure(), closeConnection(), and detailError(). Definition at line 113 of file Xaction.h. References dnsLookupDone(), finalizeLogInfo(), masterLogEntry(), maybeLog(), service(), setOutcome(), and tellQueryAborted(). Definition at line 74 of file Initiate.cc. References CbcPointer< Cbc >::clear(), and Adaptation::Initiate::theInitiator. Referenced by Adaptation::Iterator::noteInitiatorAborted(), Adaptation::Icap::Launcher::noteInitiatorAborted(), noteInitiatorAborted(), Adaptation::Initiate::sendAnswer(), and tellQueryAborted(). Definition at line 244 of file Xaction.cc. References al, cancelRead(), closer, comm_remove_close_handler(), connection, connector, debugs, disableRetries(), doneWithIo(), Comm::Connection::fd, haveConnection(), HERE(), AccessLogEntry::icap, NULL, AccessLogEntry::IcapLogEntry::outcome, reader, reuseConnection, service(), status(), writer, Adaptation::Icap::xoError, and Adaptation::Icap::xoGone. Referenced by callEnd(), detailError(), handleCommTimedout(), and swanSong(). Definition at line 76 of file Xaction.h. References buf, callEnd(), callException(), cancelRead(), closeConnection(), dieOnConnectionFailure(), doneAll(), doneReading(), doneWithIo(), doneWriting(), fillDoneStatus(), fillPendingStatus(), fillVirginHttpHeader(), haveConnection(), mayReadMore(), openConnection(), parseHttpMsg(), scheduleRead(), scheduleWrite(), status(), swanSong(), and updateTimeout(). Referenced by dieOnConnectionFailure(), handleCommClosed(), handleSecuredPeer(), and noteInitiatorAborted(). Definition at line 322 of file Xaction.cc. References debugs, detailError(), ERR_DETAIL_ICAP_XACT_START, HERE(), Adaptation::Icap::ServiceRep::noteConnectionFailed(), service(), TexcHere, and AsyncJob::typeName. Referenced by detailError(), dnsLookupDone(), and noteCommConnected(). Definition at line 136 of file Xaction.cc. References debugs, isRepeatable, status(), and AsyncJob::typeName. Referenced by Adaptation::Icap::ModXact::echoMore(), Adaptation::Icap::Launcher::launchXaction(), Adaptation::Icap::ModXact::noteServiceReady(), Adaptation::Icap::ModXact::parseBody(), Adaptation::Icap::ModXact::prepEchoing(), Adaptation::Icap::ModXact::startSending(), Adaptation::Icap::ModXact::virginConsume(), and Adaptation::Icap::ModXact::waitForService(). Definition at line 129 of file Xaction.cc. References debugs, isRetriable, status(), and AsyncJob::typeName. Referenced by closeConnection(), Adaptation::Icap::ModXact::decideOnRetries(), Adaptation::Icap::Launcher::launchXaction(), noteCommRead(), Adaptation::Icap::ModXact::noteServiceReady(), openConnection(), and Adaptation::Icap::ModXact::waitForService(). Definition at line 194 of file Xaction.cc. References asyncCall(), Adaptation::Service::cfg(), Comm::COMM_ERROR, Adaptation::Icap::Config::connect_timeout(), connection, connector, cs, Dns::CachedIps::current(), data, DBG_IMPORTANT, debugs, dieOnConnectionFailure(), CbcPointer< Cbc >::get(), getOutgoingAddress(), HERE(), Adaptation::ServiceConfig::host, JobCallback, noteCommConnected(), NULL, Comm::OK, Adaptation::ServiceConfig::port, Ip::Address::port(), Comm::Connection::remote, ScheduleCallHere, service(), AsyncJob::Start(), String::termedBuf(), and Adaptation::Icap::TheConfig. Referenced by clearError(), and icapLookupDnsResults(). Definition at line 417 of file Xaction.cc. References connector, AsyncJob::doneAll(), reader, securer, and writer. Referenced by detailError(), and Adaptation::Icap::ModXact::doneAll(). Reimplemented in Adaptation::Icap::ModXact, and Adaptation::Icap::OptXact. Definition at line 549 of file Xaction.cc. Referenced by detailError(), doneWithIo(), and mayReadMore(). Definition at line 559 of file Xaction.cc. References connector, doneReading(), doneWriting(), haveConnection(), reader, and writer. Referenced by Adaptation::Icap::ModXact::bypassFailure(), callEnd(), closeConnection(), and detailError(). Definition at line 554 of file Xaction.cc. Referenced by detailError(), and doneWithIo(). Definition at line 692 of file Xaction.cc. References MemBuf::append(), Packable::appendf(), commEof, connection, Comm::Connection::fd, haveConnection(), NULL, and stopReason. Referenced by detailError(), Adaptation::Icap::ModXact::fillDoneStatus(), and status(). Definition at line 677 of file Xaction.cc. References MemBuf::append(), Packable::appendf(), connection, Comm::Connection::fd, haveConnection(), NULL, reader, and writer. Referenced by detailError(), Adaptation::Icap::ModXact::fillPendingStatus(), and status(). Definition at line 701 of file Xaction.cc. Definition at line 640 of file Xaction.cc. References al, Adaptation::Service::cfg(), current_time, RefCount< C >::getRaw(), Adaptation::ServiceConfig::host, AccessLogEntry::IcapLogEntry::hostAddr, HTTPMSGLOCK(), AccessLogEntry::icap, icap_tio_finish, icap_tio_start, icap_tr_start, icapReply, icapRequest, AccessLogEntry::icp, ICP_INVALID, AccessLogEntry::IcapLogEntry::ioTime, Adaptation::ServiceConfig::key, NULL, AccessLogEntry::IcpDetails::opcode, AccessLogEntry::IcapLogEntry::reply, AccessLogEntry::IcapLogEntry::request, AccessLogEntry::IcapLogEntry::reqUri, AccessLogEntry::IcapLogEntry::resStatus, service(), AccessLogEntry::IcapLogEntry::serviceName, HttpReply::sline, Http::StatusLine::status(), String::termedBuf(), AccessLogEntry::IcapLogEntry::trTime, tvSub(), and Adaptation::ServiceConfig::uri. Referenced by clearError(), Adaptation::Icap::OptXact::finalizeLogInfo(), Adaptation::Icap::ModXact::finalizeLogInfo(), and maybeLog(). Definition at line 395 of file Xaction.cc. References detailError(), ERR_DETAIL_ICAP_XACT_CLOSE, and AsyncJob::mustStop(). Implemented in Adaptation::Icap::ModXact, and Adaptation::Icap::OptXact. Referenced by handleSecuredPeer(), and noteCommConnected(). Definition at line 367 of file Xaction.cc. References assert, closeConnection(), connector, debugs, haveConnection(), HERE(), NULL, reuseConnection, status(), TexcHere, theService, and AsyncJob::typeName. Referenced by noteCommConnected(), and noteCommTimedout(). Definition at line 738 of file Xaction.cc. References AsyncCall::cancel(), Comm::Connection::close(), closer, comm_remove_close_handler(), Security::EncryptorAnswer::conn, debugs, detailError(), ERR_DETAIL_ICAP_XACT_SSL_START, Security::EncryptorAnswer::error, Comm::Connection::fd, CbcPointer< Cbc >::get(), handleCommConnected(), Comm::IsConnOpen(), Must, Adaptation::Icap::ServiceRep::noteConnectionFailed(), Adaptation::Icap::ServiceRep::noteConnectionUse(), NULL, securer, service(), TexcHere, and AsyncJob::typeName. Definition at line 566 of file Xaction.cc. References connection, Comm::Connection::isOpen(), and NULL. Referenced by Adaptation::Icap::ModXact::bypassFailure(), cancelRead(), closeConnection(), detailError(), doneWithIo(), fillDoneStatus(), fillPendingStatus(), Adaptation::Icap::ModXact::fillPendingStatus(), handleCommTimedout(), openConnection(), scheduleRead(), scheduleWrite(), Adaptation::Icap::ModXact::startReading(), and updateTimeout(). Definition at line 54 of file Initiate.cc. References i, Must, Adaptation::Initiate::theInitiator, and CbcPointer< Cbc >::valid(). Definition at line 116 of file Xaction.cc. Referenced by clearError(), and noteCommConnected(). Definition at line 632 of file Xaction.cc. References alep, finalizeLogInfo(), IcapLogfileStatus, icapLogLog(), and LOG_ENABLE. Referenced by clearError(), and swanSong(). Definition at line 543 of file Xaction.cc. References doneReading(), SBuf::length(), and readBuf. Referenced by detailError(), Adaptation::Icap::ModXact::parseBody(), Adaptation::Icap::ModXact::parseHeaders(), and parseHttpMsg(). Referenced by HttpStateData::abortAll(), Ftp::Client::abortAll(), Comm::TcpAcceptor::acceptOne(), Adaptation::Ecap::XactionRep::adaptationAborted(), Adaptation::AccessCheck::callBack(), AsyncJob::callException(), Security::PeerConnector::connectionClosed(), HttpStateData::continueAfterParsingHeader(), Ftp::Client::ctrlClosed(), Adaptation::Iterator::handleAdaptationBlock(), Adaptation::Iterator::handleAdaptationError(), Log::TcpLogger::handleClosure(), handleCommClosed(), Http::Tunneler::handleConnectionClosure(), Mgr::Forwarder::handleError(), Ipc::Forwarder::handleError(), Ipc::Forwarder::handleException(), Ipc::Inquirer::handleException(), HttpStateData::handleMoreRequestBodyAvailable(), Ipc::Inquirer::handleRemoteAck(), Ipc::Forwarder::handleTimeout(), HttpStateData::httpStateConnClosed(), HttpStateData::httpTimeout(), Comm::ConnOpener::noteAbort(), Adaptation::Icap::ModXact::noteBodyConsumerAborted(), Snmp::Forwarder::noteCommClosed(), Snmp::Inquirer::noteCommClosed(), Mgr::Inquirer::noteCommClosed(), Mgr::Forwarder::noteCommClosed(), Mgr::StoreToCommWriter::noteCommClosed(), noteCommRead(), Rock::HeaderUpdater::noteDoneReading(), Adaptation::Iterator::noteInitiatorAborted(), noteInitiatorAborted(), Adaptation::Ecap::XactionRep::noteInitiatorAborted(), HttpStateData::readReply(), Comm::ConnOpener::sendAnswer(), Rock::Rebuild::start(), Security::PeerConnector::start(), HttpStateData::start(), Ipc::UdsSender::timedout(), and HttpStateData::wroteLast(). Definition at line 385 of file Xaction.cc. References AsyncCall::cancel(), closer, handleCommClosed(), NULL, and securer. Referenced by noteCommConnected(), and repeatable(). Definition at line 278 of file Xaction.cc. References asyncCall(), closer, comm_add_close_handler(), commSetConnTimeout(), CommCommonCbParams::conn, Adaptation::Icap::Config::connect_timeout(), connection, connector, cs, dieOnConnectionFailure(), Comm::Connection::fd, fd_table, CommCommonCbParams::flag, handleCommConnected(), handleCommTimedout(), handleSecuredPeer(), masterLogEntry(), Must, noteCommClosed(), noteCommTimedout(), Adaptation::Icap::ServiceRep::noteConnectionUse(), NULL, Comm::OK, securer, service(), AsyncJob::Start(), Adaptation::Icap::TheConfig, theService, and Comm::TIMEOUT. Referenced by dnsLookupDone(), openConnection(), and repeatable(). Definition at line 453 of file Xaction.cc. References al, AccessLogEntry::IcapLogEntry::bytesRead, commEof, CommCommonCbParams::conn, debugs, disableRetries(), Comm::ENDFILE, CommCommonCbParams::flag, handleCommRead(), AccessLogEntry::icap, Comm::INPROGRESS, SBuf::isEmpty(), SBuf::length(), Must, AsyncJob::mustStop(), NULL, Comm::OK, SBuf::rawAppendStart(), readBuf, reader, Comm::ReadNow(), SBuf::reserveCapacity(), retriable(), reuseConnection, scheduleRead(), setOutcome(), CommIoCbParams::size, updateTimeout(), CommCommonCbParams::xerrno, Adaptation::Icap::xoRace, and xstrerr(). Referenced by repeatable(), and scheduleRead(). Definition at line 362 of file Xaction.cc. Referenced by noteCommConnected(), repeatable(), and updateTimeout(). Definition at line 344 of file Xaction.cc. References al, AccessLogEntry::IcapLogEntry::bytesSent, debugs, CommCommonCbParams::flag, handleCommWrote(), HERE(), AccessLogEntry::icap, ignoreLastWrite, Must, NULL, Comm::OK, CommIoCbParams::size, updateTimeout(), and writer. Referenced by repeatable(), and scheduleWrite(). Definition at line 572 of file Xaction.cc. References Adaptation::Initiate::clearInitiator(), debugs, detailError(), ERR_DETAIL_ICAP_INIT_GONE, HERE(), AsyncJob::mustStop(), CbcPointer< Cbc >::set(), setOutcome(), Adaptation::Initiate::theInitiator, and Adaptation::Icap::xoGone. Definition at line 157 of file Xaction.cc. References asyncCall(), Adaptation::Service::cfg(), connection, connector, debugs, disableRetries(), Adaptation::Icap::ServiceRep::getConnection(), haveConnection(), Adaptation::ServiceConfig::host, icapLookupDnsResults(), ipcache_nbgethostbyname(), Comm::IsConnOpen(), isRetriable, Must, noteCommConnected(), Comm::OK, Adaptation::ServiceConfig::port, Adaptation::Icap::Config::reuse_connections, ScheduleCallHere, service(), String::termedBuf(), Adaptation::Icap::TheConfig, and AsyncJob::typeName. Referenced by detailError(), Adaptation::Icap::OptXact::start(), and Adaptation::Icap::ModXact::startWriting(). Definition at line 523 of file Xaction.cc. References buf, SBuf::c_str(), commEof, SBuf::consume(), debugs, error(), Http::Message::hdr_sz, SBuf::length(), mayReadMore(), Must, Http::Message::parse(), readBuf, Http::Message::reset(), and Http::scNone. Referenced by detailError(), and Adaptation::Icap::OptXact::parseResponse(). Definition at line 47 of file Xaction.h. References isRepeatable, noteCommClosed(), noteCommConnected(), noteCommRead(), noteCommTimedout(), and noteCommWrote(). Definition at line 46 of file Xaction.h. Referenced by noteCommRead(), and tellQueryAborted(). Definition at line 440 of file Xaction.cc. References connection, haveConnection(), JobCallback, SBuf::length(), Must, noteCommRead(), Comm::Read(), readBuf, reader, and updateTimeout(). Referenced by detailError(), Adaptation::Icap::OptXact::handleCommConnected(), Adaptation::Icap::OptXact::handleCommRead(), noteCommRead(), and Adaptation::Icap::ModXact::readMore(). Definition at line 331 of file Xaction.cc. References connection, haveConnection(), JobCallback, Must, noteCommWrote(), updateTimeout(), Comm::Write(), and writer. Referenced by detailError(), Adaptation::Icap::OptXact::handleCommConnected(), Adaptation::Icap::ModXact::handleCommConnected(), and Adaptation::Icap::ModXact::writeSomeBody(). Definition at line 79 of file Initiate.cc. References Adaptation::Initiate::clearInitiator(), Adaptation::Initiator::noteAdaptationAnswer(), ScheduleCallHere, and Adaptation::Initiate::theInitiator. Referenced by Adaptation::Ecap::XactionRep::blockVirgin(), Adaptation::Iterator::handleAdaptationBlock(), Adaptation::Iterator::handleAdaptationError(), Adaptation::Icap::OptXact::handleCommRead(), Adaptation::Icap::Launcher::noteAdaptationAnswer(), Adaptation::Icap::ModXact::startSending(), Adaptation::Iterator::step(), Adaptation::Initiate::tellQueryAborted(), Adaptation::Ecap::XactionRep::useAdapted(), and Adaptation::Ecap::XactionRep::useVirgin(). Definition at line 123 of file Xaction.cc. References Must, NULL, and theService. Referenced by Adaptation::Icap::ModXact::bypassFailure(), callException(), clearError(), closeConnection(), Adaptation::Icap::ConnWaiterDialer::ConnWaiterDialer(), Adaptation::Icap::ModXact::decideOnPreview(), dieOnConnectionFailure(), dnsLookupDone(), finalizeLogInfo(), Adaptation::Icap::ModXact::finalizeLogInfo(), handleSecuredPeer(), Adaptation::Icap::OptXact::makeRequest(), Adaptation::Icap::ModXact::makeRequestHeaders(), Adaptation::Icap::ModXact::maybeAllocateHttpMsg(), noteCommConnected(), Adaptation::Icap::ModXact::noteServiceAvailable(), Adaptation::Icap::ModXact::noteServiceReady(), openConnection(), Adaptation::Icap::ModXact::parseIcapHead(), Adaptation::Icap::ModXact::shouldAllow204(), Adaptation::Icap::ModXact::shouldAllow206any(), Adaptation::Icap::ModXact::start(), swanSong(), updateTimeout(), Adaptation::Icap::ModXact::validate200Ok(), and Adaptation::Icap::ModXact::waitForService(). Definition at line 585 of file Xaction.cc. References al, debugs, HERE(), AccessLogEntry::icap, AccessLogEntry::IcapLogEntry::outcome, and Adaptation::Icap::xoUnknown. Referenced by callException(), clearError(), Adaptation::Icap::OptXact::handleCommRead(), Adaptation::Icap::ModXact::maybeAllocateHttpMsg(), noteCommRead(), noteInitiatorAborted(), Adaptation::Icap::ModXact::prepEchoing(), and Adaptation::Icap::ModXact::prepPartialBodyEchoing(). Referenced by Ftp::Server::AcceptCtrlConnection(), Ftp::Server::checkDataConnPre(), clientListenerConnectionOpened(), Ftp::Client::connectDataChannel(), TunnelStateData::connectedToPeer(), FwdState::connectStart(), TunnelStateData::connectToPeer(), dnsLookupDone(), Log::TcpLogger::doConnect(), FwdState::establishTunnelThruProxy(), Ipc::Coordinator::handleCacheMgrRequest(), PeerPoolMgr::handleOpenedConnection(), Ipc::Coordinator::handleSnmpRequest(), httpAccept(), httpsAccept(), httpStart(), idnsInitVC(), Adaptation::Initiator::initiateAdaptation(), Ftp::Gateway::listenForDataChannel(), Ftp::Server::listenForDataConnection(), noteCommConnected(), Log::TcpLogger::Open(), PeerPoolMgr::openNewConnection(), peerProbeConnect(), Rock::SwapDir::rebuild(), Mgr::FunAction::respond(), Mgr::InfoAction::respond(), FwdState::secureConnectionToPeerIfNeeded(), Ipc::SendMessage(), Mgr::Inquirer::sendResponse(), snmpConstructReponse(), SquidMain(), Ident::Start(), Adaptation::AccessCheck::Start(), CacheManager::start(), Security::PeerConnector::startCertDownloading(), TunnelStateData::startConnecting(), Ftp::StartGateway(), Ftp::StartRelay(), PeerPoolMgrsRr::syncConfig(), and Rock::SwapDir::updateHeaders(). Definition at line 143 of file Xaction.cc. Referenced by Adaptation::Icap::OptXact::start(), and Adaptation::Icap::ModXact::start(). Definition at line 663 of file Xaction.cc. References MemBuf::append(), Packable::appendf(), buf, MemBuf::content(), fillDoneStatus(), fillPendingStatus(), MemBuf::reset(), and MemBuf::terminate(). Referenced by Adaptation::Icap::ModXact::bypassFailure(), callEnd(), Adaptation::Icap::ModXact::callException(), Adaptation::Icap::ModXact::checkConsuming(), closeConnection(), Adaptation::Icap::ModXact::decideWritingAfterPreview(), detailError(), disableRepeats(), disableRetries(), Adaptation::Icap::ModXact::echoMore(), Adaptation::Icap::OptXact::handleCommConnected(), Adaptation::Icap::ModXact::handleCommConnected(), handleCommTimedout(), Adaptation::Icap::OptXact::handleCommWrote(), Adaptation::Icap::ModXact::ModXact(), Adaptation::Icap::ModXact::parseMore(), Adaptation::Icap::OptXact::parseResponse(), Adaptation::Icap::ModXact::stopBackup(), Adaptation::Icap::ModXact::stopParsing(), Adaptation::Icap::ModXact::stopSending(), Adaptation::Icap::ModXact::stopWriting(), Adaptation::Icap::ModXact::swanSong(), Adaptation::Icap::ModXact::waitForService(), Adaptation::Icap::ModXact::writeMore(), and Adaptation::Icap::ModXact::writePreviewBody(). Definition at line 598 of file Xaction.cc. References CallJobHere, SBuf::clear(), closeConnection(), cs, debugs, HERE(), maybeLog(), Adaptation::Icap::ServiceRep::noteConnectionFailed(), NULL, readBuf, service(), Adaptation::Initiate::swanSong(), tellQueryAborted(), and CbcPointer< Cbc >::valid(). Referenced by detailError(), Adaptation::Icap::OptXact::swanSong(), and Adaptation::Icap::ModXact::swanSong(). Definition at line 87 of file Initiate.cc. Referenced by Adaptation::Ecap::XactionRep::adaptationAborted(), Adaptation::Iterator::handleAdaptationError(), Adaptation::Icap::Launcher::noteXactAbort(), Adaptation::Initiate::swanSong(), Adaptation::Iterator::swanSong(), and Adaptation::Icap::Launcher::swanSong(). Definition at line 619 of file Xaction.cc. References CallJobHere1, Adaptation::Initiate::clearInitiator(), CbcPointer< Cbc >::get(), RefCount< C >::getRaw(), icapReply, icapRequest, repeatable(), retriable(), CbcPointer< Cbc >::set(), and Adaptation::Initiate::theInitiator. Definition at line 422 of file Xaction.cc. References commSetConnTimeout(), commUnsetConnTimeout(), connection, haveConnection(), Adaptation::Icap::Config::io_timeout(), JobCallback, Must, noteCommTimedout(), NULL, reader, service(), Adaptation::Icap::TheConfig, and writer. Referenced by detailError(), noteCommRead(), noteCommWrote(), scheduleRead(), and scheduleWrite(). Definition at line 149 of file Xaction.h. Referenced by closeConnection(), Adaptation::Icap::OptXact::finalizeLogInfo(), finalizeLogInfo(), Adaptation::Icap::ModXact::finalizeLogInfo(), noteCommRead(), noteCommWrote(), and setOutcome(). Definition at line 148 of file Xaction.h. Referenced by Adaptation::Icap::ModXact::finalizeLogInfo(), and maybeLog(). Definition at line 61 of file Xaction.h. Referenced by Adaptation::Icap::Launcher::launchXaction(), and Adaptation::Icap::ModXact::start(). Definition at line 146 of file Xaction.h. Referenced by closeConnection(), handleSecuredPeer(), noteCommClosed(), and noteCommConnected(). Definition at line 134 of file Xaction.h. Referenced by Adaptation::Icap::OptXact::doneReading(), doneReading(), fillDoneStatus(), noteCommRead(), parseHttpMsg(), and Adaptation::Icap::ModXact::parsePart(). Definition at line 130 of file Xaction.h. Referenced by cancelRead(), closeConnection(), dnsLookupDone(), fillDoneStatus(), fillPendingStatus(), haveConnection(), noteCommConnected(), openConnection(), scheduleRead(), scheduleWrite(), and updateTimeout(). Definition at line 143 of file Xaction.h. Referenced by closeConnection(), dnsLookupDone(), doneAll(), doneWithIo(), handleCommTimedout(), noteCommConnected(), and openConnection(). Definition at line 156 of file Xaction.h. Referenced by dnsLookupDone(), noteCommConnected(), and swanSong(). Definition at line 153 of file Xaction.h. Referenced by finalizeLogInfo(), Adaptation::Icap::OptXact::handleCommRead(), Adaptation::Icap::ModXact::handleCommRead(), and Xaction(). Definition at line 152 of file Xaction.h. Referenced by finalizeLogInfo(), Adaptation::Icap::OptXact::handleCommConnected(), Adaptation::Icap::ModXact::handleCommConnected(), and Xaction(). Definition at line 151 of file Xaction.h. Referenced by finalizeLogInfo(), Adaptation::Icap::ModXact::start(), and Xaction(). Definition at line 58 of file Xaction.h. 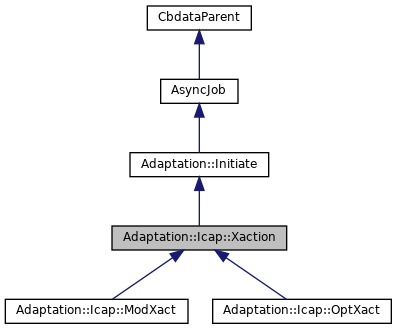 Referenced by Adaptation::Icap::ModXact::expectIcapTrailers(), Adaptation::Icap::OptXact::finalizeLogInfo(), finalizeLogInfo(), Adaptation::Icap::ModXact::gotEncapsulated(), Adaptation::Icap::ModXact::handle100Continue(), Adaptation::Icap::OptXact::handleCommRead(), Adaptation::Icap::ModXact::ModXact(), Adaptation::Icap::ModXact::parseIcapHead(), Adaptation::Icap::OptXact::parseResponse(), and tellQueryAborted(). Definition at line 57 of file Xaction.h. Referenced by finalizeLogInfo(), Adaptation::Icap::OptXact::makeRequest(), Adaptation::Icap::ModXact::makeRequestHeaders(), tellQueryAborted(), Xaction(), and ~Xaction(). Definition at line 138 of file Xaction.h. Referenced by noteCommWrote(), and Adaptation::Icap::ModXact::stopWriting(). Definition at line 137 of file Xaction.h. Referenced by disableRepeats(), repeatable(), and Adaptation::Icap::ModXact::virginConsume(). Definition at line 136 of file Xaction.h. Referenced by Adaptation::Icap::ModXact::bypassFailure(), Adaptation::Icap::ModXact::callException(), Adaptation::Icap::ModXact::decideOnRetries(), disableRetries(), openConnection(), retriable(), and Adaptation::Icap::ModXact::virginConsume(). Definition at line 133 of file Xaction.h. Referenced by mayReadMore(), noteCommRead(), Adaptation::Icap::ModXact::parseBody(), parseHttpMsg(), Adaptation::Icap::ModXact::parseMore(), Adaptation::Icap::ModXact::parsePart(), Adaptation::Icap::OptXact::parseResponse(), Adaptation::Icap::ModXact::readMore(), scheduleRead(), Adaptation::Icap::ModXact::stopParsing(), and swanSong(). Definition at line 144 of file Xaction.h. Referenced by cancelRead(), closeConnection(), doneAll(), doneWithIo(), fillPendingStatus(), noteCommRead(), Adaptation::Icap::ModXact::readMore(), scheduleRead(), Adaptation::Icap::ModXact::startReading(), and updateTimeout(). Definition at line 135 of file Xaction.h. Referenced by Adaptation::Icap::ModXact::bypassFailure(), closeConnection(), handleCommTimedout(), noteCommRead(), Adaptation::Icap::ModXact::parseIcapHead(), Adaptation::Icap::OptXact::parseResponse(), and Adaptation::Icap::ModXact::stopWriting(). Definition at line 157 of file Xaction.h. Referenced by doneAll(), handleSecuredPeer(), noteCommClosed(), and noteCommConnected(). Definition at line 140 of file Xaction.h. Definition at line 51 of file Initiate.h. Referenced by Adaptation::Initiate::clearInitiator(), Adaptation::Icap::Launcher::doneAll(), Adaptation::Initiate::initiator(), noteInitiatorAborted(), Adaptation::Initiate::sendAnswer(), Adaptation::Icap::Launcher::start(), Adaptation::Initiate::swanSong(), Adaptation::Iterator::swanSong(), Adaptation::Icap::Launcher::swanSong(), Adaptation::Icap::ModXact::swanSong(), and tellQueryAborted(). Definition at line 131 of file Xaction.h. Referenced by handleCommTimedout(), noteCommConnected(), and service(). Referenced by AsyncJob::AsyncJob(), AsyncJob::callEnd(), callEnd(), AsyncJob::callStart(), AsyncJob::deleteThis(), dieOnConnectionFailure(), disableRepeats(), disableRetries(), handleCommTimedout(), handleSecuredPeer(), AsyncJob::mustStop(), openConnection(), Xaction(), AsyncJob::~AsyncJob(), and ~Xaction(). Definition at line 145 of file Xaction.h. Referenced by closeConnection(), doneAll(), doneWithIo(), doneWriting(), fillPendingStatus(), noteCommWrote(), scheduleWrite(), Adaptation::Icap::ModXact::stopWriting(), updateTimeout(), Adaptation::Icap::ModXact::writeMore(), and Adaptation::Icap::ModXact::writeSomeBody().